Milepost 154: A Train Blog: Another Train Meet! So there I was, waiting for a downhill train I'd heard some miles away. On point was UP 7355, a General Electric C45ACCTE with 4,400 hp built in 2009. Beautiful, bright colors with, undoubtedly, a nice, clean, cab interior. I had no scanner at the time, so I missed the detector at MP148.9 indicating a train was coming uphill. A beautiful double-stack, heading west in May -- downhill, towards Secret Town. Traffic in the area, to and from Roseville, has been spotty at best. Recently, more trains have been running at night than during the day. 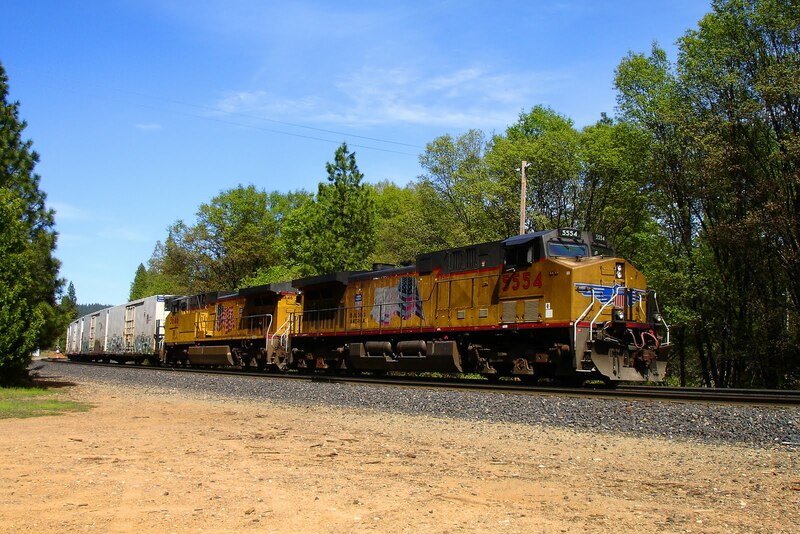 Types of trains seem to be evenly split between double stack and mixed manifest. The sun was with me on the next two photos, pointing east. Late afternoon sun on double-stack well cars. The red containers really stand out in sharp contrast to the green trees and blue skies. The passing of these cars sucked the hat right off my head -- luckily it didn't flip under the wheels and I was able to recover it later. And then, a horn off to my right! I had to focus quickly and hope for a gap in the cars -- which there was! UP 5569 on point slugged uphill -- a General Electric C44ACCTE with 4,390 hp built in 2004. I caught it! Another train meet -- very tough to capture! UP 5569 downhill, and UP 7355 uphill. 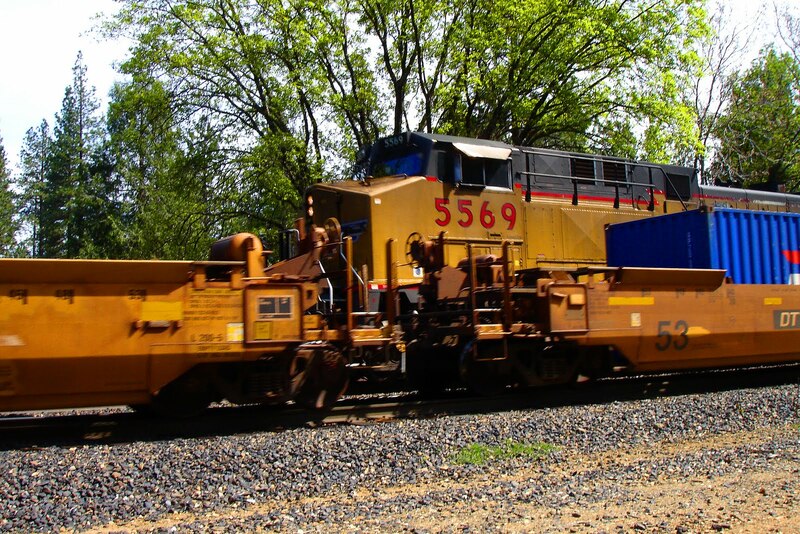 Both are GE locomotives. 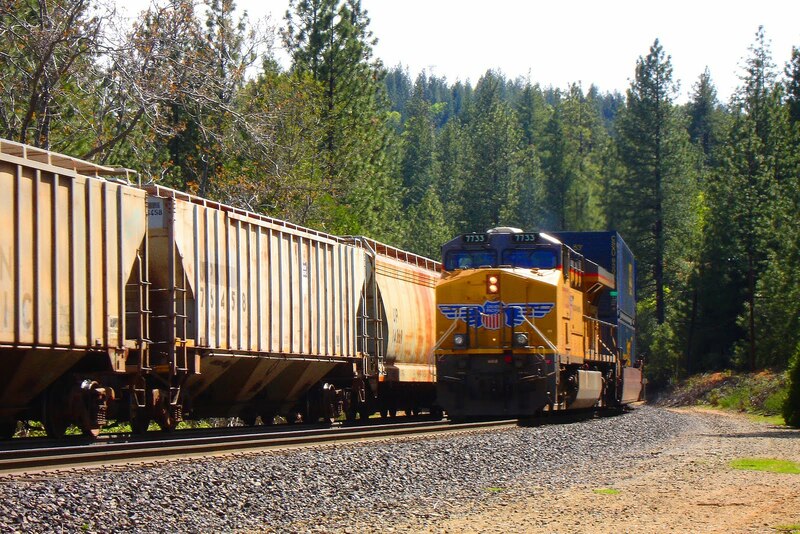 In the #2 position uphill (eastbound) behind UP 5569 is UP 4434, an EMD SD70M (one of 1,083 owned by Union Pacific!) built between 2000 and 2004 and possessing 4,000 hp. 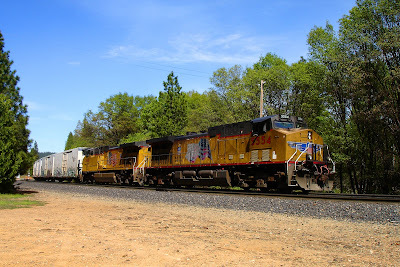 Behind UP 4434 is an EMD SD90MAC with the 4,300 hp engine (clue: no beveled engine room cover), its number obscured. 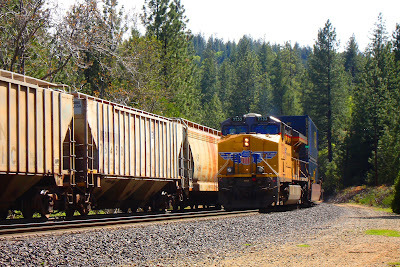 Double stack downhill, a mixed manifest train (called a "pig") uphill. "Pigs" receive the last priority for traffic on UP lines. UP 7733, a DPU (Distributed Power Unit), runs in dynamic braking at the rear of the downhill train. DPUs are unmanned, and controlled from the cab of the engine on point, via Locotrol, by the engineer. UP 7733 is a GE C45ACCTE (AC powered traction motors with "Controlled Tractive Effort") sporting 4,400 hp and built between 2007 and 2008. WSF, thank you most kindly sir!